There’s an old saying among Catholics which goes back well over a thousand years. “Ignorance of Scripture is ignorance of Christ.” Of course, some might be surprised to hear this, as the old stereotype is that Catholics don’t read their Bibles. That couldn’t be farther from the truth. “The sacred synod also earnestly and especially urges all the Christian faithful, especially Religious, to learn by frequent reading of the divine Scriptures the ‘excellent knowledge of Jesus Christ’ (Phil. 3:8)… Therefore, they should gladly put themselves in touch with the sacred text itself, whether it be through the liturgy, rich in the divine word, or through devotional reading, or through instructions suitable for the purpose and other aids which, in our time, with approval and active support of the shepherds of the Church, are commendably spread everywhere” (Dei Verbum 25). Individual or small group Bible studies are great ways to come to a closer union with our Lord. We are fed by the Word of God in the Eucharist, and we can also be nourished by God’s Word in another sense by reading Sacred Scripture. But when we do find ourselves in these Scripture studies, we must be sure to avoid the traps that many Christians have fallen into. While several things in Scripture can be interpreted in different ways legitimately (such as the actual length of time that passed during the Creation), there are certain things in Scripture that have been defined dogmatically (such as the nature and necessity of baptism). By becoming engrossed in God’s Word, we find ourselves in an intimate conversation with our heavenly Father. Throughout Scripture we see God conversing with the various prophets and patriarchs. God enters into covenants with these men and their descendants, and when Jesus begins His public ministry we see that the Old Covenant has been fulfilled in him, extending the opportunity to enter into the New Covenant to all peoples. When we engross ourselves in Sacred Scripture, we find ourselves deepening our relationship with our Lord. Even though we hear the same readings often enough during the Liturgy of the Word, there’s something to be said for reading something like the Psalms or one of the Gospels all the way through on your own. Instead of taking Scripture in bite sized chunks, we are offered a different perspective, and we see our beloved Jesus in a somewhat different way when we dedicate time specifically for reading from the Bible. “‘The Word of God, which is the power of God for salvation to everyone who has faith, is set forth and displays its power in a most wonderful way in the writings of the New Testament’ which hand on the ultimate truth of God’s Revelation. Their central object is Jesus Christ, God’s incarnate Son” (CCC 124). “The unity of the two Testaments proceeds from the unity of God’s plan and his Revelation. The Old Testament prepares for the New and the New Testament fulfills the Old; the two shed light on each other; both are true Word of God” (CCC 140). How could we as Christians possibly be ignorant of “the power of God for salvation”? The contents of the Bible make us more familiar with God’s will for us. To be ignorant of that would be folly. “[W]hen you pray, go into your room, close the door and pray to your Father, who is unseen. Then your Father, who sees what is done in secret, will reward you” (Matthew 6:6). 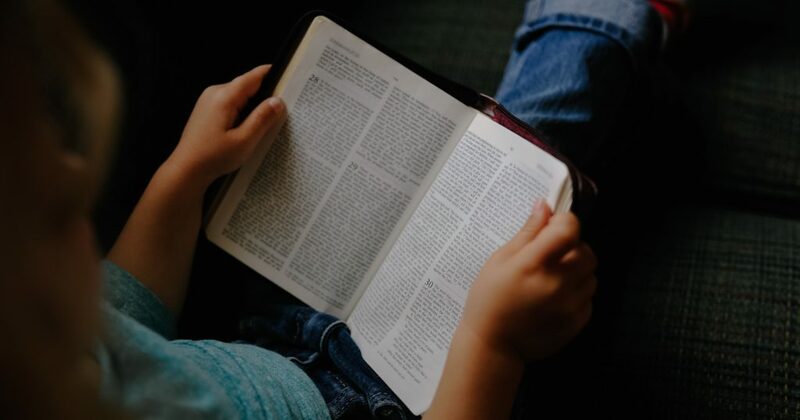 This can lead us to the practice of Lectio Divina, which is accessible to both the person already deeply grounded in Scripture, and to the person who has just started to immerse themselves in God’s Word. A common mistake that one can fall into during either solo or small group Bible studies is that the doctrines of the Church can sometimes be pushed a bit to the side. A mentality that the various pronouncements of the Church are secondary to the Bible can be problematic. That’s why it’s always great to have someone on call to converse with when coming behind a particularly confusing passage. “Philip ran to him, and heard him reading Isaiah the prophet, and asked, ‘Do you understand what you are reading?’ And he said, ‘How can I, unless someone guides me?’ And he invited Philip to come up and sit with him” (Acts 8:30-31). No one wants to be seen as being more Catholic than the pope. In the same way, we should not aspire to become our own pope. As mentioned above, that was the main problem with the various founders of Protestantism. Luther himself would often proclaim that “Scripture interprets Scripture.” But it’s clear that such a notion is ridiculous once we look at real life situations. “There are some things in [Paul’s Letters] hard to understand, which the ignorant and unstable twist to their own destruction, as they do the other Scriptures” (2 Peter 3:16). “[T]he Holy Fathers, We say, are of supreme authority, whenever they all interpret in one and the same manner any text of the Bible, as pertaining to the doctrine of faith or morals; for their unanimity clearly evinces that such interpretation has come down from the Apostles as a matter of Catholic faith. The opinion of the Fathers is also of very great weight when they treat of these matters in their capacity of doctors, unofficially; not only because they excel in their knowledge of revealed doctrine and in their acquaintance with many things which are useful in understanding the apostolic Books, but because they are men of eminent sanctity and of ardent zeal for the truth, on whom God has bestowed a more ample measure of His light” (PD 14). One good place to start, as far as the Gospels go, is with the Catena Aurea, or “Golden Chain”. Commissioned by Pope Urban IV, St. Thomas Aquinas painstakingly compiled many writings and commentaries by the Church Fathers in order to bring about a deeper understanding of Scripture to those studying it. For those that wish to be of one mind with the Church, the Catena Aurea is a great resource to have on hand when delving deep into Scripture. It is clear therefore that, in the supremely wise arrangement of God, sacred Tradition, Sacred Scripture and the Magisterium of the Church are so connected and associated that one of them cannot stand without the others. Working together, each in its own way, under the action of the one Holy Spirit, they all contribute effectively to the salvation of souls” (CCC 80, 95). This is the classic three-legged stool. If you take out one or two legs, the entire edifice collapses. Scripture is meant to be taken in tandem with Tradition and the Magisterium. Revelation is transmitted by more than just Scripture. Our Protestant brothers and sisters—and perhaps even some Catholics—might be troubled hearing that, but it’s something important to keep in mind when we start wondering why there are so many divisions in Christianity. The simple answer to this is because many Christians have deviated from the teaching of that Church founded by Christ. When Sacred Tradition and the Magisterium are treated as second rate, or worse, we find ourselves in a fragmented Christianity. To put a bow on all this, it’s clear that the reading of Scripture is of paramount importance to every Christian. If we want to know Christ, we must become intimately familiar with the books of the Bible. But in the Catholic Faith, we so very often deal with “both/and’s” instead of “either/or’s”. We need both Scripture and Tradition. Both are sacred, and both are interpreted by the Church’s Magisterium, particularly in faith and morals. There is some latitude in interpreting certain biblical passages, but since the Church is our Mother, we can always trust her judgment due to the promises that our Lord has made regarding her. “This Magisterium [of the Church] is not superior to the Word of God, but is its servant… At the divine command and with the help of the Holy Spirit, it listens to this devotedly, guards it with dedication and expounds it faithfully (CCC 86). Nicholas is a cradle Catholic and hopes to give a unique perspective on life in the Church as a millennial. His favorite saints include his patron St. Nicholas, St. Ignatius of Loyola, St. Thomas Aquinas, St. John Mary Vianney and St. Athanasius of Alexandria.